Here you are, almost at the end of your Euro trip and very much at the end of your finances. You’re in one of the most beautiful cities in the world and you want to experience as much as you possibly can on a budget of… well, not a whole lot. No problem, for there is plenty to see and explore for free. Ahhh, Paris. You can smell the fresh baked bread and delicious pastries around every corner. If you’re looking for that classic Parisian ‘eat a croissant and drink coffee for breakfast’ lifestyle, head on over to Blé Sucré. This is a classic French Café which is recognized to have the best croissants in the city. This café is well priced, but if it’s too costly to purchase one yourself, enjoy the smells and possible samples that this beautiful bakery has to offer. I would say @apester07 recommends the Croissant Au Buerre. When you're eating the best croissant au buerre in Paris, you savor every single bite. I've never had a croissant so perfectly made with a crispy, flaky crust. Inside is perfectly moist (😉) and slightly sweet. We bought a few more for later and now thinking about how we can make a pit stop here everyday until we have to go back home. If you’re all filled up on coffee and pastries, it may be time to go see the sights. This museum was home to writer George Sand and painter Ary Scheffer, providing a romantic flash back to the artists’ time living in the home with their lovers, Chopin and Delacroix. If you require more caffeine, you can pick it up at the museum’s garden café. The gardens cover 25 hectares of land and are split into French gardens and English gardens. The terraces include lush lawns, 106 statues, chestnut groves, ponds, forest, playgrounds, orchards, rose gardens, honey production, The Orangerie, The Pavillion Davioud, and the 1630-built Fontaine des Médici. The cultural programme is characterized by free photography exhibitions on the garden railings, the Honey Festival, art expeditions, and concerts in the bandstand. This Italian fountain located within Jardin du Luxembourg, was built in 1630, and was originally created for Maria de’Medici, Queen of France. The fountain consists of ‘Polyphemus surprises Acis and Galatea’, ‘Diana’, and ‘The Basin’ . This museum is dedicated to the work of Russian sculptor Ossip Zadkine (1890-1967). He grew up in Russia, lived in England, and debuted his artwork in Paris. In this studio, he lived and worked through 1928-1967. The museum opened in 1982 to conserve the live-in studio feature of the location, as well as to honour Zadkine’s career. Admission: Permanent collections are free in temporary exhibition periods. Great museum to get out of the line ups at the Louvre. The museum features a 2-level cafe with an outdoor space and a nice bookstore, with books of art and touring destinations. It is located right at the metro station (Clemenceau) and is regarded as an architecturally stunning building. This historic neighbourhood consists of steep and cobbled streets, historic walking areas, neighbourhoods, a thriving art scene, and landmarks that deserve to be fully explored. Chances are you’ll hear some live music on your way through moulin rouge, or walking to the famous Basilica Sacre Couer. Recognized as the best metro stop for Montmartre, as well as being the only station with a surviving art nouveau canopy, complete with lights and signs. This charming square features niche cafe’s, street markets, and ethnic restaurants. It’s located in the centre of Montmartre, and if you’re wandering the narrow streets, you’re bound to arrive here. This location is renowned for its ‘Love Wall’ / ‘Le Mur Des Je T’aime’. The mural features “I love you” written in hundreds of different languages and has become a prime spot within Montmartre to sneak in a romantic photo. The wall was imagined by Frederic Baron, who began to collect ‘I love you’s’ in 1992, then teamed up with caligrapher and artist, Claire Kito to create it. Visit the mural for free while on your way to the Sacré-Coeur Basilica. 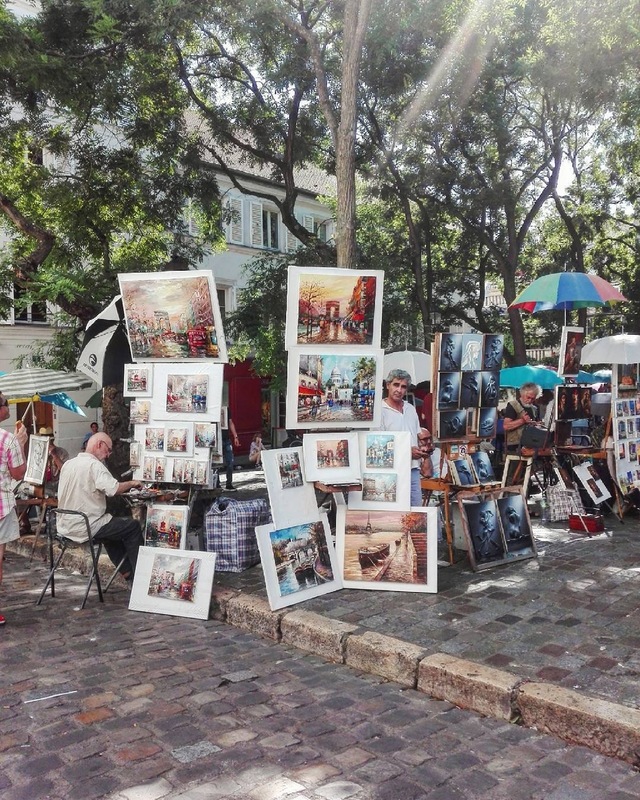 In the heart of Montmartre, you can find Place du Tertre where the 20th century art scene was booming. This location was home and workplace to countless legends in the art community, those who lived while art was still pure and highly regarded. 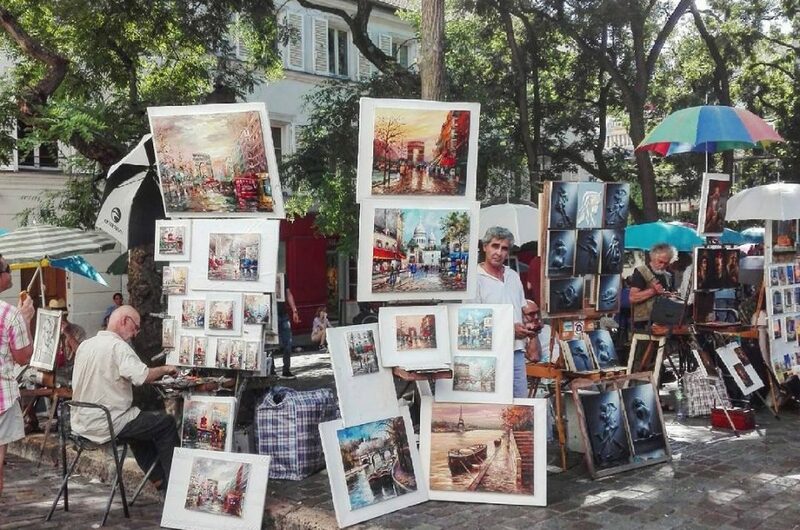 Now it is filled with portrait sketchers and caricaturists trying to pay tribute to the artists before them, such as, Picasso, Soutine, Derain, Modigliani, and Van Gogh. In local shops you can find wall plaques which identify the buildings famous artists once drank coffee in, or peed in the washroom, etc..
A crêperie with unique combinations and fresh ingredients. Such combos include chorizo, melon, and sardines for the summer season. The restaurant serves breakfast, lunch, and dinner, as well as accommodates vegetarian and gluten free options. Split a crêpe and enjoy the many flavours at an affordable price. The best spot in town ! This restaurant has the food and ambiance to make it feel like home. It is a quiet and cozy place to enjoy a delicious glass of wine and experience Paris with a Portuguese twist. Guests have been impressed by the use of organic and high quality ingredients at a reasonable price. Customers have called this classic Husband and Wife run Parisian Café, a quaint and comfortable gem. With genovese beans imported from Australia, it upholds high quality coffee, lattes, cappuccinos, and hot chocolate. It is hip, trendy, and just off the tourist track. After you’ve enjoyed lunch, you can take some croissants to go and enjoy them in this lovely natural park. It offers stunning views from above Montmartre to pick out where you’ve walked, featuring bridges, waterfalls, a large pond, trails, and a quaint café. It is a natural gem in the middle of a large city where you can enjoy the afternoon on a run, walk, or picnic. This is a spot for the locals. The market has a wonderful array of goods, old love letters, french records, 1960s, vintage clothes, and antiques. Haggling is commonplace here, as dealers usually drop their prices by 10-15% if properly persuaded. Although the name translates to be “new bridge”, it is the oldest bridge over the Seine River. It features stunning architecture from 1600s, with details of stone masks, and the equestrian statue of Henry IV at the middle of the bridge. The bridge consists of 12 arches, with impressive stone structure to connect the two sides of Paris. On the bridge is the new spot to attach locks to a fence. Write the name of you and your lover, and lock it onto the fence. Then you both can walk hand in hand, across the bridge, along the Seine, and down to Square du Vert-Galant. This cosy park is set in the western tip of the Île de la Cité and can be accessed by taking stairs down from Pont Neuf (where you can find the wall of love locks). From the island, you can see boats sailing by from either side as you look out at the Seine, while enjoying a basket picnic on the grass. While the sun sets, you may even see some sparkling tea lights floating down the stream. The whole park really provides a Parisian bohemian vibe with just a touch of magic. Now this is the place to finish off your memorable day. Have a glass of wine, watch the sunset over the river, and cheers to the memories made in Paris. All can be enjoyed and explored with a voyalific guide – connect with a local explore guide here. Don't miss a thing! Sign up to receive travel tips and offers. Voyalific helps bring tourists and locals together. Avoid the tourist traps and find hidden gems. © 2016-2017 - Voyalific. All rights reserved.